We have just released the first update to the Ones and 0s album which is a members only “Digg the Code Lounge Version” and we really hope you like it – you can read a bit more about the background of this version over at Geoff’s blog. 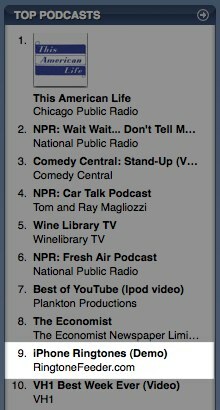 It has been a great couple of days and we are really excited to see that following the release of the “Worldwide Hello” free ringtone on July 11th – RingtoneFeeder is currently among the top 10 podcasts in iTunes. We would like to thank all of you who subscribe to our service – we really appreciate it – and for sending us all the great feedback since the day we started RingtoneFeeder back in April. We will continue to evolve and improve and we are looking forward to announce new and exciting developments in the not so distant future. If you are not yet a subscriber, please try out the free feed and if you like what you hear then you can subscribe and get the latest 10 ringtones 11 ringtones right away including the the “Worldwide Hello”. We have just released a new iPhone wallpaper based on the weekly ringtone “Great Day” video as well as a wallpaper for the “Ones and 0s” album which was recently released here on RingtoneFeeder. You can either download the wallpapers directly or you can subscribe to the Photocast and have them delivered to your favorite photo application such as iPhoto for example and then sync them to your iPhone. If you have any suggestions for new wallpapers, please drop us a line and if you haven’t already make sure you get Geoff’s latest album. Since this is a big iPhone week – we thought we would contribute a bit to welcome the new iPhone. 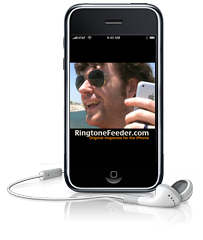 We have therefore release a tribute ringtone for the new iPhone 2.0 and at the same time taking the opportunity to send a friendly localized “hello” from RingtoneFeeder to the many new countries getting iPhones this week. 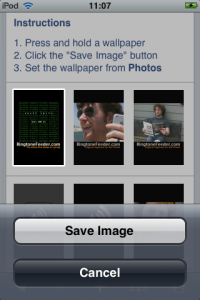 The ringtone is available both for subscribers (just check your feed in iTunes) as well as in the free feed.